As an absolute huge fan of Stephen Stills‘ late sixties and early seventies output (ever heard Mannasas!?) the news of a, recently unearthed, mass of previously unreleased demos from ’68 immediately piqued my curiosity. While his sometime bandmate/friend/arch-rival, Neil Young, gets most of the critical accolades these days (and rightfully so), thirty five years ago, Stills was right up there with ‘ol Shakey, both in terms of creativity and a consistently solid prolific output. 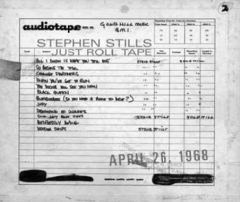 The story behind Just Roll Tape goes that back in 1968 (April 26th to be exact), Stills was hanging out in a recording studio, in New York, with his former girlfriend, the folk-singer, Judy Collins (see nameseke: “suite: judy blue eyes”), as she laid down tracks for her upcoming album. After the session, Stills convinced the engineer to let him record a batch of new demos that would go on to flesh out album by CSN, and Stills’ solo records. Caveat Emptor: This is most definitely not for those who hate rough, unproduced, recordings. The tape, at times, warbles and hisses, as does Stills voice and guitar, but for those with an ear, captured within are the seeds of greatness. Check out the rough demos below of “Suite: Judy Blue Eyes,” “Treetop Flyer,” and the final studio version of “Treetop Flyer” that would not be released until 1991’s Stills Alone LP. + Download your music DRM free through eMusic’s 25, no risk, Free MP3 offer. “Just Roll Tape” is truly amazing in many ways, especially to hear Stills (who is usually cocksure to cockrock in much of his work) unsure and sensitive about himself and his material, and at a critical juncture in his career. It is also astounding to see how many of Stills’s great CSN(Y) and solo songs were written by early ’68. In many ways, his well of decent songs dried up rather quickly, almost totally after 1972. Just goes to show the dangers of ego and cocaine. I saw CSNY last summer, and it was a little sad to see what Stills has become physically and vocally. Once he was a true powerhouse. Eat a peach. Yes, I too was a fan of Stills and Manassas. When I unpacked my vinyls and set up my turntable a few months ago, they were some of the first stuff I wanted to play. I’ve been a big fan of Stills & his Manassas group incarnation, particularly that 1st Manassas album, the self-titled double album. I’m looking forward to hearing “Just Roll Tape”. I decided to just order it and hear what there is to hear, so I’m not downloading anything to play now. I’ll sit down and pop open the CD when it gets here and roll along with that old tape and see what it’s like. You folks have it right–at least in my view. Stills was a powerhouse from 1967 through 1972. He was a splendid songwriter with an impressive range–folk, blues, rock. His voice was one of the best in rock (Carry On and Woodstock still blow me away). And his guitar playing was so tasty. Good tone, clean bends, simple but melodic fills. Bluebird, Wooden Ships, 4 + 20, Carry On, Bound to Fall, Johnny’s Garden–they’re all so amazing. But Stills was also a remarkable arranger and producer. The bass, organ, and piano arrangements on CSN and Deja Vu are so integral to the songs. Without them, the albums would have turned out very differently. All I can say is the Just Roll Tape CD reveals what we knew all along–that Stills was a giant creative force that had a profound affect on the music that came after it. I can’t go into post-1972. It’s too difficult. 1) Amazon “Product Description” has this session taking place in a New York recording studio, and the “Editorial Review” describes the recording after a Judy Collins session. This must have been for her LP “Who Knows Where the Time Goes.” But — the liner notes to this LP (CD) says that the sessions were recorded at Elektra Sound Recorders in Los Angeles. 2) The Buffalo Springfield Box Set’s booklet includes a list of concert dates, and it has the band performing April 26, 1968, at Exhibition Hall, Arizona State Fairgrounds, in Phoenix, Arizona. So something isn’t quite right. Stills is the essence of the old day .. I still have the leather fringe coat, the stills vinyl and the cranky vinyl player. Manassas is one the best of all times .. that album; along with illegal, II, live, and the CSN bunch have transitioned from vinyl to cassette to cd to disk and I can’t ever see a day when I don’t count them as the top. The man’s favorite tuning – EEEEBE (which he applies to about 50 guitars) makes it work. The old days brought out the best in him as others have pointed out. The last live show for me was a fine Austin hill country venue called the Backyard in 90′. He still had the stuff of legend. nuff said. John Haeny to record “Just Roll Tape” . I concur with the sentiments above. As a 17 yo in 1973 I had an argument with a friend who said Neil Young was better than Stills. I even had the Supersesssion album.But really after 1972 Stills lost songwriting skill, and his solo vocals are MIA and Stills contribution to “Long May You Run” is sludge – unlistenable!. Bob Dylan is the first tier on his own and Neil is 2nd tier with 10 others like Bruce, The Beatles, Stones, Cohen etc.